We did just enough to get by thinking we'd never actually need any of it. But in the real world, you need math. Whether splitting a check, buying new hardwood floors, or figuring the payout of a split-bet on the roulette table, you need to know how to figure volumes, square footage, and use fractions, so why not take a minute to freshen up? Let’s take a trip down memory lane and think about the first day of middle school. You’re at a new building with an actual class schedule and a locker combination that no matter how hard you try, you forget every weekend. It was a scary time. Well, class is back in session. And it’s math class. I always enjoyed math. It was probably because math has an absolute answer. There are theorems to prove and you either prove them or you don’t; end of story. In English there are rules but times when you can break them and times when you don’t care at all. Don’t even get me started on science. But math, it is black and white. I’m going to venture a guess that we all remember the Pythagorean Theorem. Or do we? It states that on any right triangle (you do remember what that is right?) that the two edges that make up the 90-degree angle, a-squared and b-squared will always equal c-squared. I remember that but I have no idea how it applies to my life today… or anyone’s life for that matter. 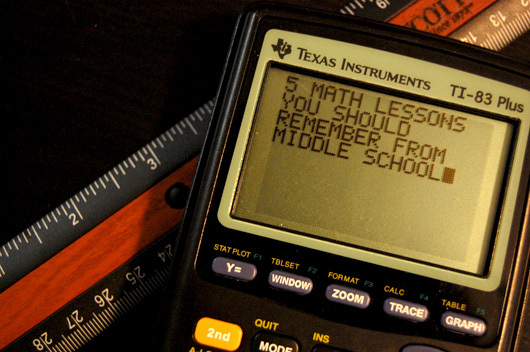 But there are some things you should definitely remember from those middle school math days. I remember back when I learned long division. I was a pretty big geek back then and would take two sheets of paper, tape them together and divide 63,673,986,326,115 by 146 and just see what happens. While this isn’t your typical math problem, division without a calculator is important. Today it occurs at a random moment, but I will need to do a division problem without a calculator. It’s simple, but easy to forget how to do it. Seriously, can you divide 42 by 3 without a calculator? This was one of my favorite parts of math class. This I understood and I was good at it. On one hand this can mean when you have a simple equation where you solve for ‘x’. I’m more talking about when you have 45 inches and it needs to be converted into millimeters. I love these. Sometime they were tricky because of the amount of steps required but if you work in a lot of industries, this knowledge can come in real handy. In one of my lines of work, I often have to convert between measurements like picas, pixels and inches. They are all very different so the numbers are not easy to convert. No matter your work, it’s important to remember this little trick. Duh! You need to understand what 500 sq. ft. means so when you’re shopping for apartments in Chicago and currently live in an 850 sq. ft. apartment, you know what the means for your giant entertainment center and massive bedroom set. Also understanding these numbers can help determine the value of a home, as well as the size of a moving truck when you do move. 500 sq. ft. may sound like a lot, but think of it this way: a regulation football field has 54,000 sq. ft. Your 500 sq. ft. apartment is only a measly 1% the size of that field. Which beer, er, soda is the better buy per volume? Which cereal? Which economy size of ketchup? These are every day equations for the economical shopper like myself. I absolutely hate pulling out my cell phone while I’m in the grocery store, but this is one I’m still not good at. Beyond that, being able to calculate the volume in a tube or a balloon might sound odd, but just wait until you have to buy sand for an art project and have no idea how much you’ll need or you need helium for your fiancé’s bridal shower. I distinctly remember when I was in college, I had to ask my dad for help with this very area. I’d still have to today if faced with doing fraction work by hand. It just doesn’t make sense to me. But in today’s world, our finances, our taxes, home loans, virtually everything is done in percentages and fractions and you must know how to multiply and divide fractions. Most importantly, you must understand the answer. That is where I fall down. These five things are pretty easy but I believe, vital to understand so you can manage your finances better and just have a better understanding of the world around you. Amazing how after physics and calculus, etc. Simply doing long division without a calcular can be a task!